I'm so excited to feature this give away!! If you follow my blog, you know how much I love EQ7 and I design and make lots of quilts with Electric Quilt, some of my quilts are featured on their website, and also recently my blog entry about what to do with blocks from block swaps, was featured on EQ's blog. Plus, you can still use the discount code for their eqboutique I mentioned here. A Full version of EQ7!!! Draw beautiful, original blocks and stencils, or let EQ7 create new blocks for you. Over 5000 scanned fabrics. Find them by theme (modern to antique), by color (you can even search by color), or by fabric company. Scan your own fabrics, then crop and "tweak" them right in EQ7. YOU HAVE TO HAVE YOUR SETTINGS SET TO ALLOW ME TO REPLY. 4. tell me if you have an older version of EQ or if it would be new to you! so 4 chances to win. post BEFORE midnight on sunday dec 18th. I will draw a number with random.org on monday the 19th and contact you. Then you email me back your address and I will send that to Electric Quilt and they will send you out this awesome CHRISTMAS PRESENT! Click on the picture to join the fun!! I've signed up for the EQ newsletter! I don't have a blog so I've emailed my sewing group! I've never had EQ before and I don't even know anyone with it! I'm signed up for the EQ newsletter. I told my quilting friends about this. I have just become a subscriber to your blog. EQ would be new to me. I have subscribed to the EQ newsletter. I am a follower and I subscribe to EQ blog. EQ would be new to me. I would love to design my own quilts.Thank you for this awesome giveaway. I have subscribed to the newsletter, tols at lap east one other person about the giveaway, and subscribed to the blog. Have no version of EQ currently. I forwarded your email with details about your giveaway to 10 quilting friends. I would love to win this but don't know how good I would be with it... Thanks for this chance. I posted on my sidebar!! I am subscribed to the EQ newsletter. I actually own EQ7 and am learning how to use it, but I have friends who sure would love to own it, too! I just emailed my friend Renea about the giveaway! thanks for the chance of winning my own EQ! I don't have any version of EQ. I would love it! I subscribed to EQ's newsletter. I do not currently have EQ software. This would be the best Christmas present!! I already subscribe to the eq newsletter. I have subscribed to your blog. Signed up to get this pretty blog emailed to me, signed up with EQ for newsletters, have told a friend... gosh I really want this LOL! Hi, I am a new follower of your blog! I have signed up with EQ, this is a fantastic program! I have used a very early program and thought it was the Bee's Knees then. This just has to be wonderful and useful in so many ways. Thanks! No I do not own it. You and I have talked about it some. I have looked on line and there are even classes to help learn EQ. This is one giveaway that I am thrilled about!!!! I am a new follower of your blog. Thanks so much for this amazing giveaway. I am signed up to the EQ newsletter. I have the EQ6 but I have never learned how to use it :-( I would love to know how to use this program, and I understand version 7 is much better. Thanks! Well, I've heard so many things about this EQ and I would love to own a copy. I'm now following your blog. Thanks for a chance to win! I signed up for the EQ newsletter. And I do NOT own a copy...but boy would that make me the happiest Mama this Christmas to win one. =) Thanks for the chances to win! I'm excited. I've become a follower. THANKS for the giveaway. I have EQ6 but don't know how to use it. I had already decided 2012 would be the year to learn EQ7. This would be new to me. Hi Bea, I blogged about this great give-away on my blog, http://dakotaessence.wordpress.com/. Hi! I just became a follower! I signed up for the EQ newsletter. Thanks for the link! I don't have EQ at all, so it would be new to me. I have been wanting it for some time now, though! Hi, I just found you through your guest post on Quilting Gallery. Love your work! I'm a new follower and would love to win EQ7. Thanks for the giveaway! I have EQ5, but would love the new version since I can't upgrade anymore. I am a new follower, great giveaway! I am signed up for the Electric Quilt newsletter. I am a new follower of your blog. I so want this gift, do you hear me "giveaway Santa"? Thanks for the opportunity to win. I do not have an older version of EQ. Thank you once again. I am a new follower. I DREAM of owning this program. Thanks for the giveaway chance! I signed up for EQ's newsletter, too. thanks! I have a very old version of EQ (4 I think) but never learned how to use it properly. I see that the later versions are much more user-friendly. Thanks again! A friend told me about your giveaway, and I have told another friend. This is such a generous giveaway, thank you. I am not s user as I was waiting for them to come out with a MAC version. I understand that won't happen. I do have a PC I could set this up on, so if I am a winner, I will go that route. I'm signed up for the EQ7 Newsletter. I don't have EQ7 or any earlier version but I would love to have it. Thanks for the great giveaway. EQ would be new to me! Bea, can you include the link to the Blog Hop Party on this post please. This is the one I'll be linking to. Hi I'm a new follower. EQ is new to me. I just became a follower. I read your guest blog on quiltinggallery.com and would like to become a tester. I don't own EQ but would be excited to own it. I am meeting with my quilting group next Saturday for a sew in and will tell everyone about it. I signed up for the EQ newsletter and I currently have EQ5. I would love to try all the new features. I told my quilting daughter about this awesome contest and will be sure to mention it at my next guild meeting. I have subscribed to EQ's newletter. I told my mother about this giveaway. Electric Quilt would be totally new to me! I had EQ1 and also EQ 3 or 4 -- would love to have the current version! I signed up for the EQ newsletter! I have EQ 5. I've had EQ 7 on my wishlist for some time now! I am a follower! Thaks so much for the giveaway! I just signed up for the EQ newsletter! I'm with my friend here and just told her about this super give away! I would love to have a chance to win and try the new Electric Quilt 7 since I love to design my own quilts! Thanks for the opportunity of this super win! I don't have EQ but heard a lot about it. Would love to own it and to try it out. Thanks for the chance! EQ blog sent me to this giveaway. I am a subscriber of the EQ newsletter. This EQ would be totally new to me. I have told me friend Lanette about this. Some times we purchase things together to share the expense. EQ would be totally new for me. So excited. I am your newest follower. I have EQ7 on my Christmas list and really really hope I win it just in case Santa doesn't come through!! I am SO excited to find a blog about EQ7 as I was wondering if I would be able to figure it out and how best to utilize the software once I do. I look forward to learning from you and seeing all your projects. Thanks so much for offering the giveaway, it would be such a blessing for one of us!! I have signed up for the newsletter. See, I didn't even know there was one! Again thank you!!! I am telling my BFF about it as soon as I finish my comments here on your blog. Her name is Donna, and she has a lovely blog called Donna's Lavender Nest. She is also a quilter. She will be very excited to hear about this too! 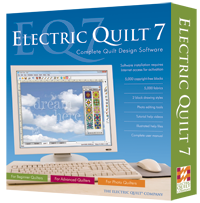 I do not own any of the Electric Quilt software as of now. Hopefully though . . . .
Do not nor have ever owned any version of EQ. It has been one those things that I have been drooling over for quite some time. I do not own any version of EQ but would love to. I would love to win. I am a new follower. I do not own a version yet. I am following and have been wanting to upgrade from my version 5 for sometime. I work in the graphic arts and love being able to work my quilting into the computer! I will be forwarding your email to ALL my quilting friend! Thanks Bea! I have already signed up for the EQ newsletter. If I won this it would be new to me. I'm so excited about this wonderful and Gracious Give A Way. I just signed up for The EQ Newletter. Wow oh wow...how I would LOVE this! I'm a new follower! I signed up for the EQ newsletter - thanks for the chance! EQ is new to me! I usually sketch on graph paper or create things in Word. EQ would be fabulous!